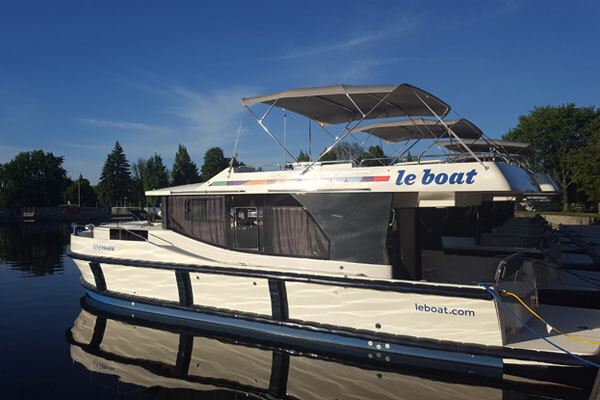 It’s only been a year since Le Boat announced that it was expanding into North America and opened its first base in Smith Falls, Ontario but it was clearly the right course for the company to chart. Now, the self-drive river and canal cruise holiday specialist is planning to build on the success of its 2018 inaugural season, with plans to expand its fleet of cruisers and add a satellite base in Seeley’s Bay, Ontario in 2019. For the 2019 season, Le Boat will add an additional four boats to the Canadian Horizon fleet, including the state-of-the-art Horizon 5. The largest and most luxurious in the premium Horizon fleet, the Horizon 5 is 49.17 (14.99 m) long, and sleeps up to 12 people, with five double bedrooms complete with ensuite bathrooms, and a convertible settee in the saloon. The boat offers increased space, a fully stocked kitchen with all linens, rear outdoor seating and a sundeck with BBQ – all the comfort and convenience needed for a vacation on the water with a large family or group of friends. Le Boat’s 2019 expansion will also include the addition of a new satellite base in the village of Seeley’s Bay, Ontario. This base will allow Le Boat guests to experience one-way cruising on the Rideau Canal for the first time. Seeley’s Bay is a charming town located on the beautiful southern route of the Rideau Canal, surrounded by the expansive lakes. The community is 25 miles (40km) North East of Kingston and 100 miles (160 km) southwest of Ottawa. From Seeley’s Bay, Le Boat cruisers can choose a 3- to 4-night getaway or a one week cruise. Head south from Seeleys Bay to visit the historic city of Kingston, Canada’s former capital, where the Rideau Canal meets Lake Ontario (8.5 hours away by boat). Alternatively, travellers can head north and cruise to Jones Falls with its spectacular staircase of locks and impressive dam. A one-way week-long cruise north will get you as far as the Le Boat base in Smiths Falls, in the heart of the Rideau. Reservations are now available for Le Boat’s 2019 cruising season (May 17 to Oct. 14, 2019), with early booking discounts available until Oct. 30, 2018. Call 1-855-734-5491 or visit www.LeBoat.ca for more information on self-drive cruiser rentals in Canada and Europe.